Thumbing its nose at ally Bharatiya Janata Party, the Shiv Sena plans to contest between 50-60 seats in the Gujarat Assembly polls on its own, a senior party official said here on Thursday. 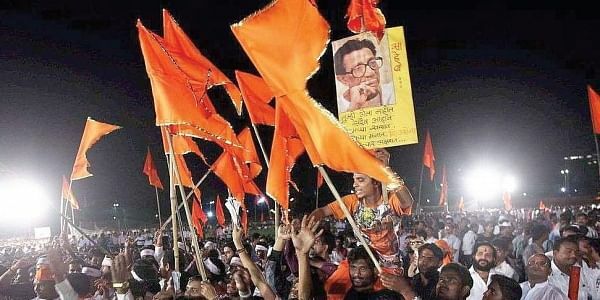 MUMBAI: Thumbing its nose at ally Bharatiya Janata Party, the Shiv Sena plans to contest between 50-60 seats in the Gujarat Assembly polls on its own, a senior party official said here on Thursday. A high-level team of the party, led by Gujarati Wing Coordinator and senior municipal corporator from Oshiwara Rajul Patel and another leader Hemraj Shah, is currently camping in the neighbouring state to finalise its candidates and political strategy. "We shall put up candidates in these constituencies, spread mainly between Surat to Ahmedabad, which has a large Maharashtrian-origin population, and even extending to pockets beyond upto Rajkot," Patel told IANS. This is because a large number of people originating from north Maharashtra, where the Shiv Sena has a significant stronghold, are either living or working in different parts of south Gujarat and other areas. "They are strong believers of our Hindutva agenda and we are going to concentrate on this large chunk in the elections. "However, Shiv Sena will not enter into any alliance with any party, though the final decision will be taken only by our President Uddhav Thackeray," she explained. Party officials in Mumbai said that Sena - an ally of the BJP both at the Centre and in Maharashtra - has contested in Gujarat in the past and managed to dent the ruling BJP in at least three assemblies. The decision to contest independently in Gujarat is part of a long-term strategy to arrest "the twin influence of BJP President Amit Shah and Prime Minister Narendra Modi" though it had stayed away in 2012, ostensibly to avoid "split in the Hindu votes", a party source said. This time around, the situation is drastically different and given the current sentiments in Gujarat and other parts of the country, the Sena is hopeful of making its influence felt there. As part of the strategy in the past few days, Thackeray has met Nationalist Congress Party (NCP) President Sharad Pawar and West Bengal Chief Minister and Trinamool Congress supremo Mamata Banerjee. It had even invited the young leader of the Patidar Anamat Andolan Samiti, Hardik Patel for a meeting in Mumbai in February. The Sena is likely to make an announcement of its entry into the Gujarat elections at a media gathering later on Thursday evening. In the 1960s, known for its anti-Gujarati plank, the party over the years softened its approach and even rewarded several Gujaratis with top posts including in the party, as municipal corporators, legislators and even in Parliament.